Picobello is the small comfortable floor wiper with great effect. 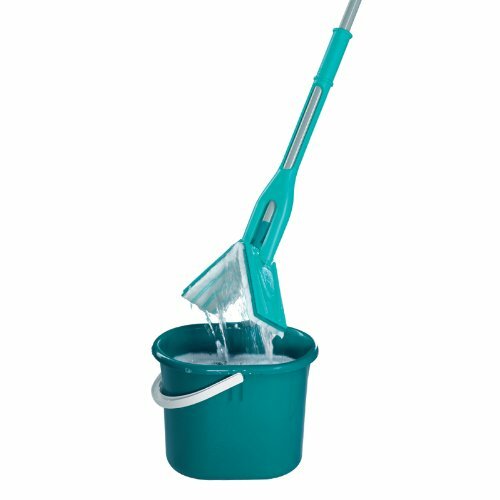 Directly on the handle it has a smoothly operating press mechanism, which enables the pressing of the wiper almost without effort, bending down and without hands in the dirty water. For coarse dirt the dirt brush has to be used. Simply turn the wiper around and the brush removes coarse dirt from the floor. Picobello is equipped with micro fibre wiper pad "micro duo". Due to its 2-fibre-system the wiper pad removes perfectly dirt from all kinds of floors. The fibers are million times branched and remove even grease and finest dirt out of the smallest unevenness. They remove the water with the dissolved dirt like empty capillaries. The flexible joint makes the Picobello an all-rounder. Whether on steps or around table- and chair-legs – floor wiper Picobello can do everything. On large areas the joint enables wiping in wavy lines. Due to the telescopic handle, which can completely be bent, hard to reach areas under armoires and beds can be cleaned. The handle is extendable from 31 up to 53-Inch. Wiper pad "extra soft" is available as an accessory and is suitable for particular moisture-sensitive floors, wiper pad "cotton plus" with cotton content is ideal for tiles and stone floors and for the removing of coarse dirt. The wiper pad is fixed on the wiper with a hook-and-loop fastener. It can be removed at will and is washable. Wiping width is 1-1/2-Inch. Leifheit guarantees for 3 years.